The Traditional Funeral Service with cremation is a standard funeral service with the deceased present. A solid oak rental casket or a special constructed cremation casket is used for the ceremony. Once the service is complete, instead of going to a cemetery, family and friends are excused and the deceased is cremated and the cremains returned to the family. The Memorial Service takes place at the convenience of the family at either the funeral home, church, or other meeting place. The cremains may be present or may not be present at the discretion of the family. Families chose this option when they do not want the body present and want the cremation to precede the funeral/memorial service. Direct cremation is the immediate cremation of the deceased with no funeral service or ceremony planned. The cremains are returned to the family to do with as they wish. 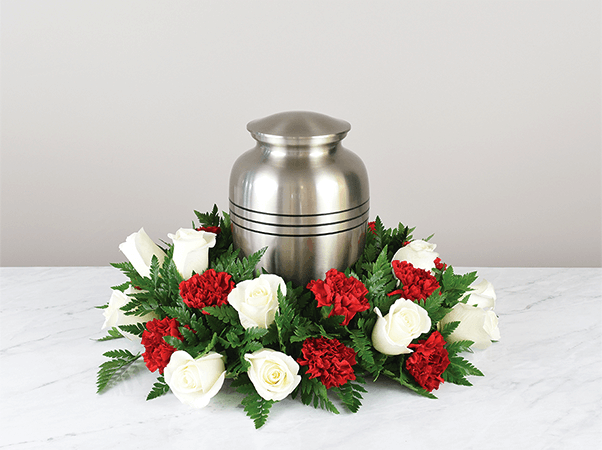 We have an extensive collection of cremation urns and jewelry. No matter the intention of the families to either keep, bury, or scatter the remains, we can be of service and provide the necessary receptacle. We are more then happy to discuss which option works best for your family.